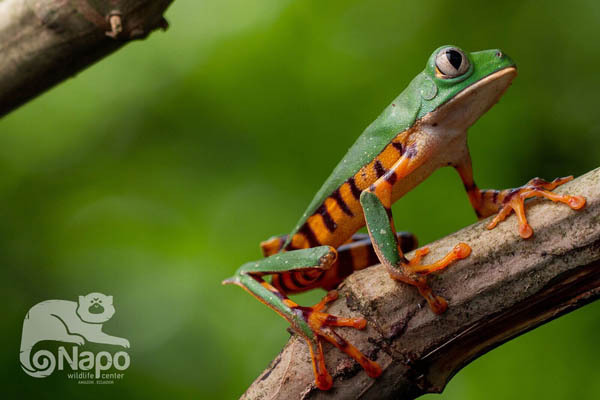 Napo Wildlife Center is not just another lodge in the Amazon. What makes an enormous difference is the fact that this lodge was built and is completely managed by an ancestral Amazonian community who takes special care of the conservation of the natural environment, and where you will enjoy activities that involve jungle hikes along the community surrounding trails of terra firme and swamp forests, canoe rides along the black waters of the Añangucocha lagoon and creeks watching the animals that make a life there, such as the black caiman, the piranhas, giant otter families and more. 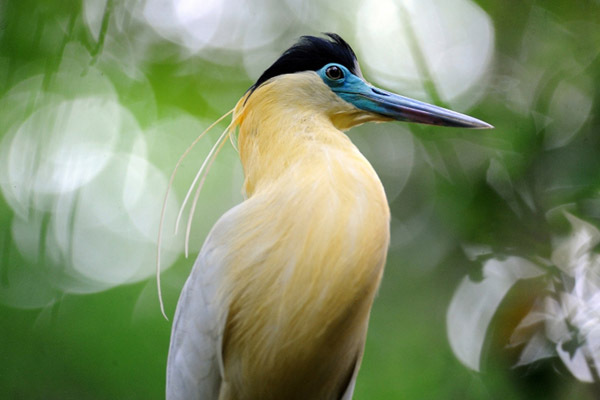 Bird watching is inevitable in the heart of the Yasuni National park, where live more than 610 species of birds, many of which you won’t find anywhere else on Earth. 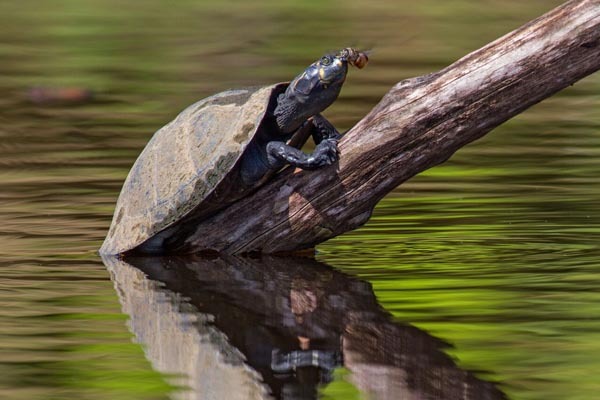 Your encounters with the wildlife there is something that will make this a once in a lifetime adventure. 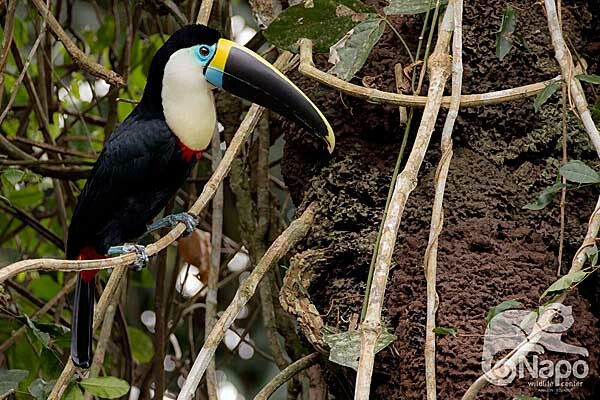 Napo Wildlife Center is situated into the Añangu territory at the northern side of the Yasuní National Park. 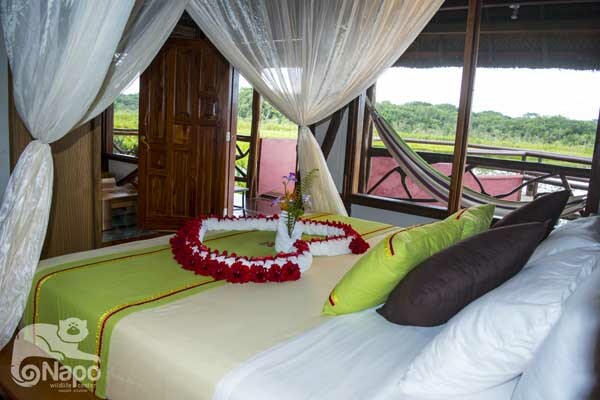 To reach the lodge it is necessary to take a 2½ hour motor boat ride down the Napo River from El Coca. Once we reach the Añangu territory, it’s necessary to take a small paddle boat for another two hours. The Napo Wildlife Center experience really begins here, as we paddle our way through waters that look like fine black tea, under the shaded canopy of the rainforest. This ride, gives visitors one of the best chances of watching several bird, primate, reptile and large mammal species in Añanagu, quickly spotted by our guides as they silently paddle through the water. Electric eels and stingrays can be seen swimming past the boat as it silently slides through this always stunning trip. Jaguars, tapirs, peccaries and anacondas have been spotted here by groups of arriving visitors. 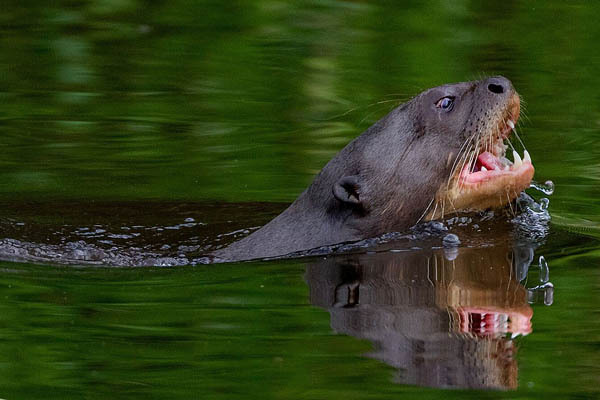 The Añangu lake is home to hundreds of freshwater fish species, including piranhas, giant “pirarucú” lung fish, sting rays, peackok bass and more; and also to otters, aquatic birds, endangered “charapa” turtles, and so on. Evening paddle boat rides offer an excellent opportunity of safely getting closer to the caimans, watch night-monkeys and other wildlife of the margins of the lake: a unique experience under the stars with the back-music of hundreds of frogs, toads, insects, nocturnal birds and the splashes of fish and caimans as they feed and mate. 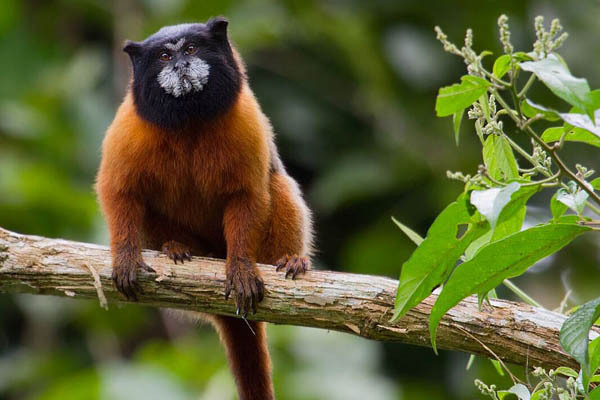 This beautiful lake will always remain an ideal, picture‐perfect backdrop for your Amazonian adventure in the Napo Wildlife Center. 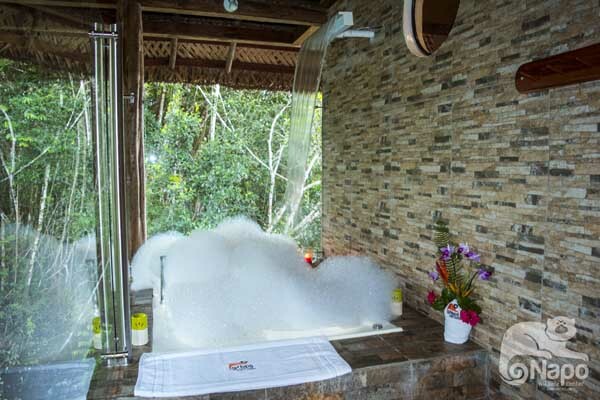 This award-winning ecolodge is a prime example of sustainable eco-tourism. We have invested in an efficient wastewater processing system as well as solar panels and silent generators to ensure minimal environmental impact. 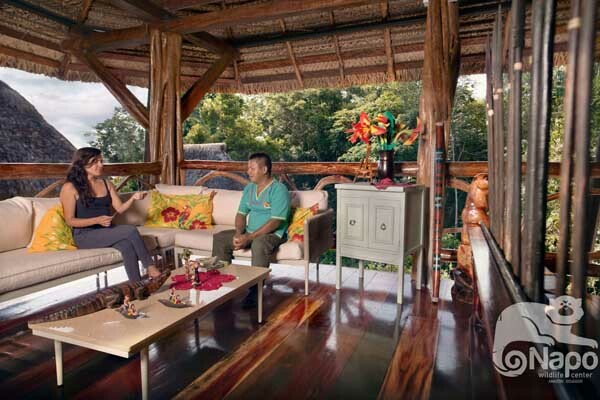 The cabañas at the Napo Wildlife Center are large and exceedingly comfortable. They were built and decorated by the Indigenous Kichwa Añangu Community with a combination of local, handcrafted, and specially sourced materials. 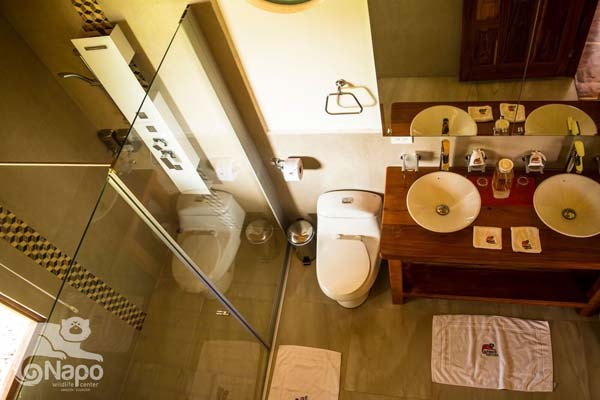 They are fully equipped with electricity, hot water, ventilation, comfortable beds, and modern bathroom finishes such as a rainfall shower. 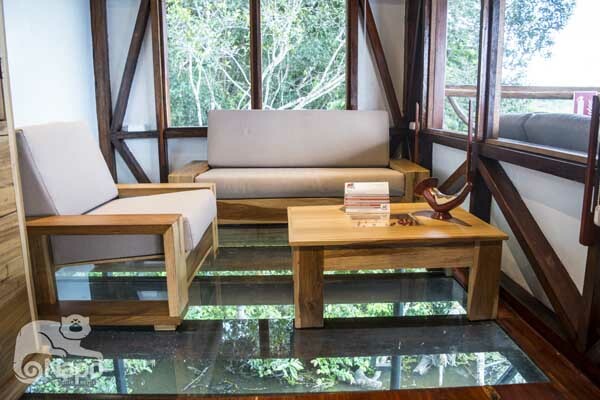 This exclusive recluse has a maximum capacity of 50 people and a variety of accommodations ranging from a standard suite to our luxury suites equipped with an additional panoramic glass floor, jacuzzi, and a private balcony which provides incredible views of the jungle and Añangu Lagoon.